There seem to be endless number of things you can bake with bananas. Even if you narrow the field down to banana and chocolate, you’re still left with several options. You can load it up with brown sugar streusel and pack it with chocolate chips. 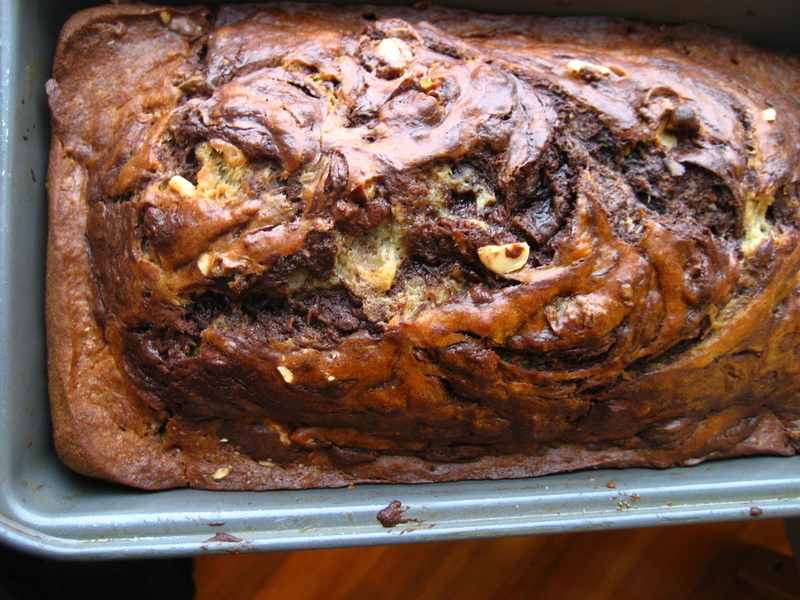 Or for something slightly less decadent, there is this marbled chocolate banana bread. Sarah introduced me to this recipe and I have seen her make it close to a dozen times. The entire loaf calls for only 4 tablespoons of butter as well as yogurt for added moisture. While I am certainly not shy about using butter in baked goods, I often find sweet breads like this load up on excessive butter and oil and end up being greasy. This recipe calls for just the right amount of fat to keep the bread moist without weighing it down. In this latest rendition of the bread, I added chopped chocolate covered almonds for something new and fun. You could use plain, chocolate chips instead, or some combination of chocolate and nuts. The bread is modestly sweet and the chocolate adds just a little bit of richness. 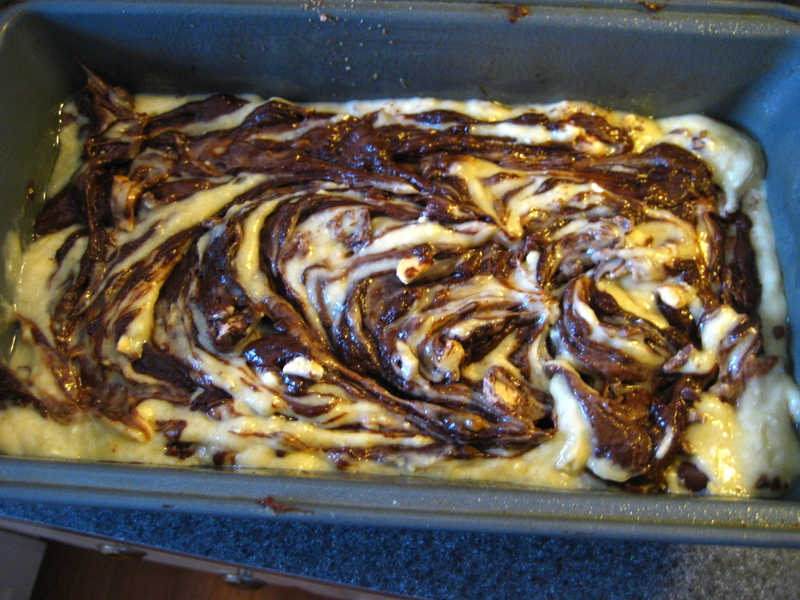 Melted chocolate is mixed with one cup of the batter and that mixture is then layered and swirled with the plain banana batter. The finished product has a glossy, slightly crispy crust that I love. It is definitely more bread than cake. The chocolate and almonds are optional but I highly recommend adding them. They provided the perfect sweetness and crunch and made this into something much more than ordinary banana bread. 2. Combine the flour, baking soda, and salt, stirring with a whisk. 3. 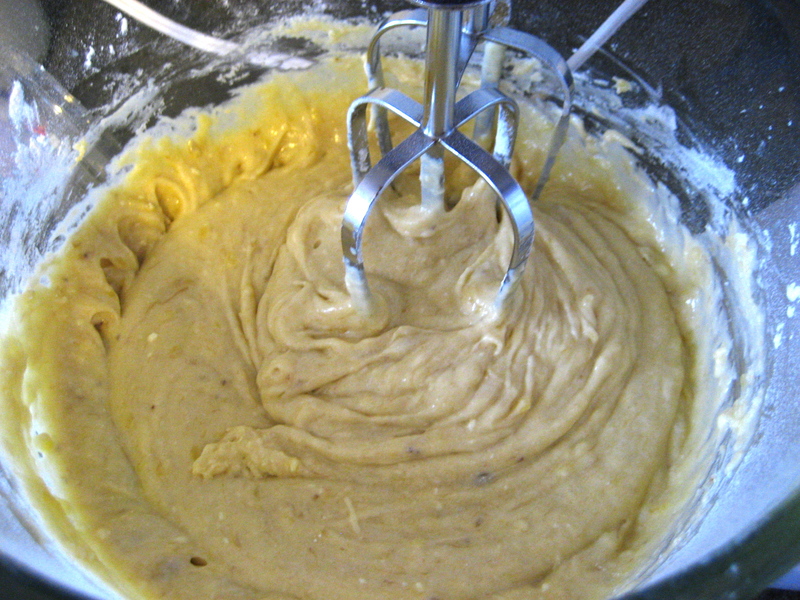 Place sugar and butter in a large bowl; beat with a mixer at medium speed until well blended (about 1 minute). Add banana, eggs, and yogurt; beat until blended. Add flour mixture; beat at low speed just until moist. 4. Place chocolate chips in a medium microwave-safe bowl, and microwave at HIGH 1 minute or until almost melted, stirring until smooth. Cool slightly. 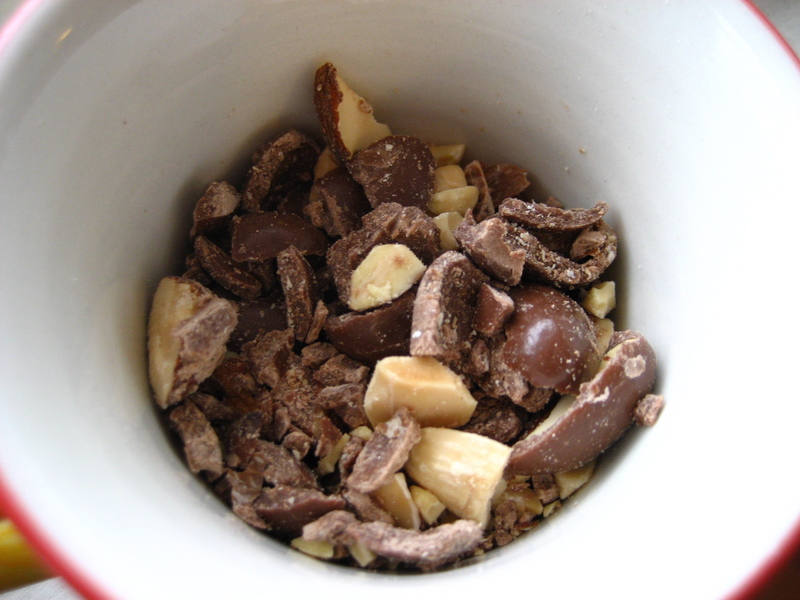 Add 1 cup batter to chocolate, stirring until well combined. 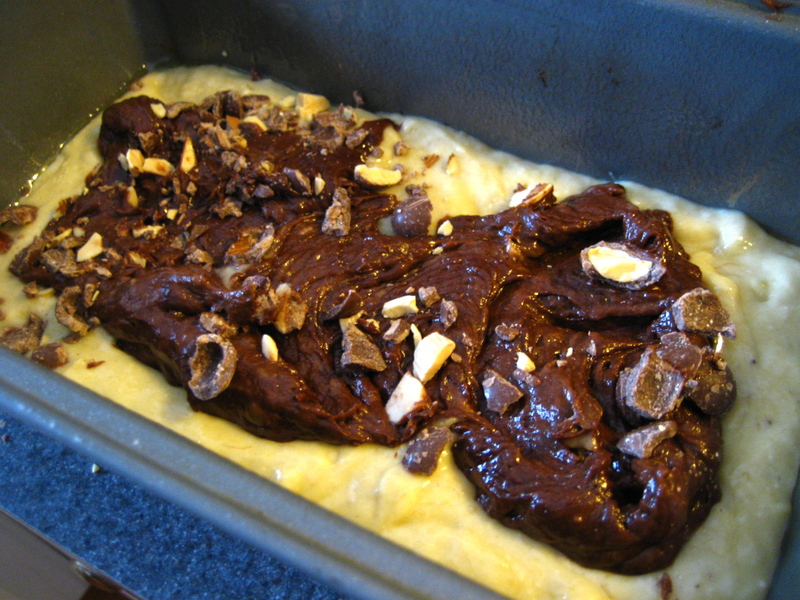 Spoon chocolate batter alternately with plain batter into an 8 1/2 x 4 1/2-inch greased loaf pan coated with cooking spray. Swirl batters together using a knife. Bake at 350° for 1 hour and 15 minutes or until a wooden pick inserted in center comes out clean. Cool 10 minutes in pan on a wire rack; remove from pan. Cool completely on wire rack. This entry was posted in Recipes and tagged baking, banana, banana bread, Cake, chocolate, dessert. Bookmark the permalink. I love the gorgeous crust on this bread and the marbling looks beautiful! That first photo is beautiful! I often screw up the marbling effect when I attempt it but yours looks perfect. Banana and chocolate is such a great combo! Totally have to credit my roommate Sarah with the swirling. She has perfected it. Looks delicious! Perfect for a cold, snowy day. Nice job Elizabeth! A note on the recipe – I usually use plain Greek yogurt, because that is what I like to eat, and most times I just dump in the whole 6oz cup because I don’t like leftovers hanging around. It doesn’t adversely affect the recipe at all, and in fact I like the added moisture. I’d caution against using vanilla yogurt – it becomes too sweet and sugary. Looks awesome!! I haven’t made banana bread in a while, and this post reminded me of that! I love banana bread with different flavors/textures. that bread looks delicious… like something you’d enjoy on christmas morning! yum. Thanks Julie! You should try making it sometime! ooh, yummy, i would love a slice right now!!! I love bananas and chocolate together. The lobby of my old office had a cafe that made amazing banana chocolate bread that I always bought as a treat after a long run. I should make this instead! This is definitely something I would try. 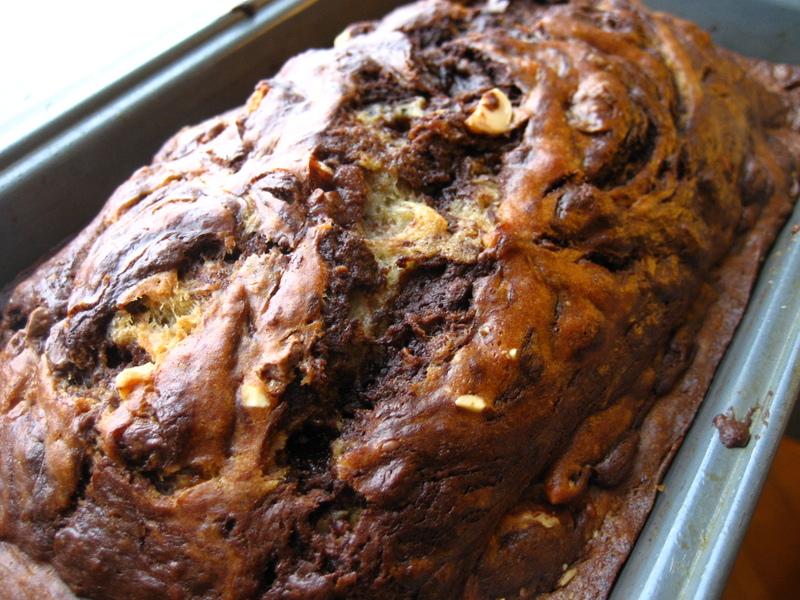 I always add chocolate chips to my banana bread, so swirling some chocolate right in would be even better! I use that Cooking Light recipe all the time, also w/FF Greek yogurt . . . but I’ve never thought to add nuts – dunno why? Chocolate covered nuts takes it over the top – looks super! I totally agree that Banana Bread can be very sweet, but this one looks excellent! I love the marbling. It’s brilliant.